The clouds cleared enough on Saturday morning for a fleet of helicopters and planes to empty the backlog of climbers and trekkers stuck in Kathmandu. The airport at Lukla was busy starting at 6 am and then well into the afternoon. I made it on a helicopter, making a last minute change from a fixed winged thinking it would be more reliable. In any event, I made it along with my bags (eventually) and started the trek from Lukla to Namche Bazaar with Kami’s son Mingma. Kami will join me Tuesday after taking a few more days rest in Kathmandu to recover from a bought of gout. The walk was as I remembered. This was my seventh time. Some people are taking helicopters from Kat to Namche these days, but I think the trade-off of two days is well worth it for the beauty of the trails and the joyful happiness of the villages. Mingma and I walked easily and gently along the well-trodden trails. Each step brought a new view, each corner a new reward. The air was soft and moist with the remnants of the monsoon season. It was warm. I was wearing a short sleeve shirt and long pants but could have been in a t-shirt and shorts! We stopped for lunch in Phakding, I had pizza and Mingma had mo mo’s. 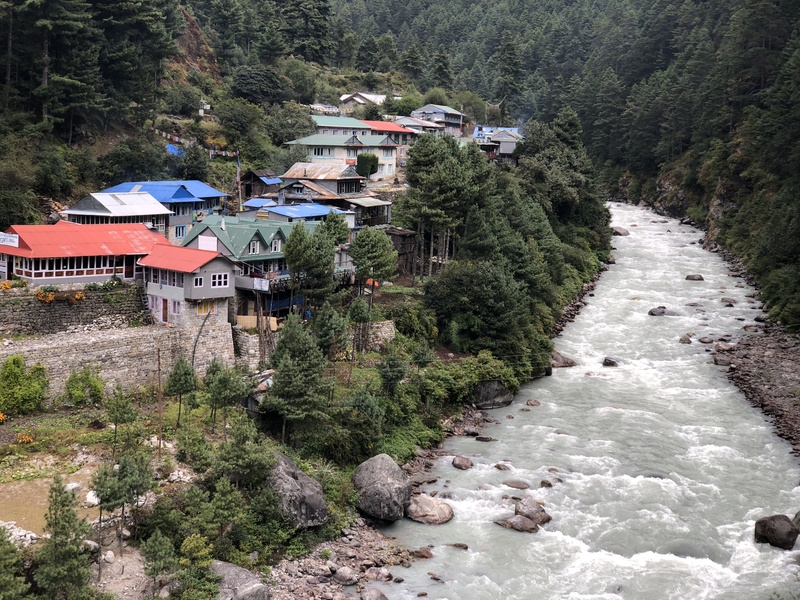 It began to sprinkle on us as we left for higher ground and the village of Monjo at the entrance to Sagarmatha National Park, the home of Mount Everest. The trail was not as full as I thought it would be for early October which is historically the largest month for trekking in Nepal. 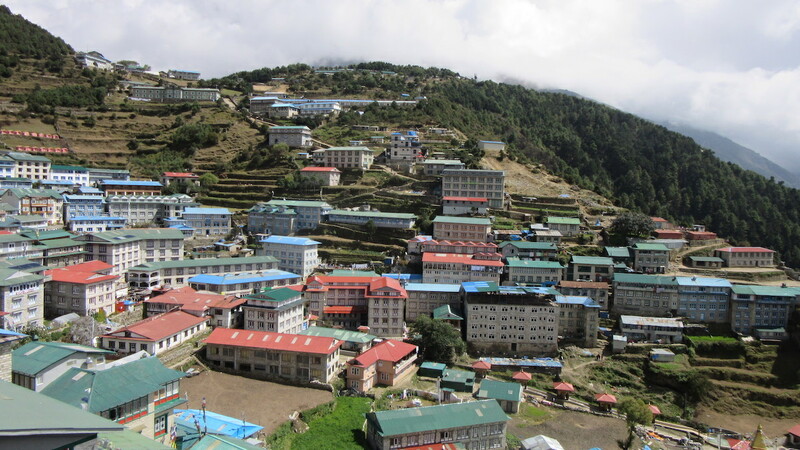 The Everest region can host well over 10,000 visitors that month alone. But those who were here seemed to stumble with glee as they struggled to multitask between avoiding rocks and missing a spectacular view. We pulled into Monjo just as the skies open with a refreshing rain storm that last about half an hour. My, how times have changed. Every teahouse has electricity, wifi and very good food and beds. Most have duvets with a soft pillow so a sleeping bag is not needed. However, the staff are the same – warm with genuine smiles and an attitude of hospitality. We had dinner and talked about Mingma’s job as an Electrical Engineer at a nearby power plant. Kami and Lhapka Dikki are so proud of him as they are of their other four children. One of Mingma’s classmates from Kathmandu joined us. He is studying Environmental Science with a speciality in air pollution. We had a great conversation about how tourism is impacting the Khumbu, recycling, hydro-electric power generation, politics and the future. My heart is filled with optimism as I spoke with these two young men. Today we made our way into the Park paying the 3,200 rupee entrance fee, $27.09 – a bargain! The trail once again had its ups and downs but more up than down as we had gained 580-meters or 1,902-feet from Lukla – albeit with some serious undulations so you can easily add another 1,000-feet! Arriving in Namche triggered some very nice memories. I will spend three nights here and visit the Khunde Hospital to talk to them about establishing a dental clinic. Cure Alzheimer’s Fund – 100% for Research and $ for$ Donation Match!!! Thanks so far for donating $4,520. We are almost halfway to the $10,000 and with the matching $10,000 we will approach $20,000. While there is still three weeks left, please don’t wait!!! Hi Alan. When you go to the Hospital, can you look for a Solar Cooker in the grounds of the hospital please. 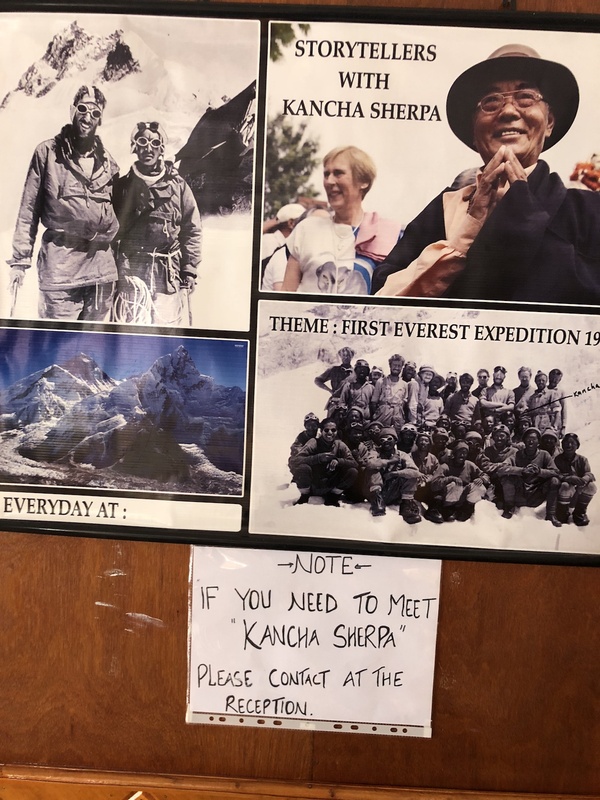 I had it installed in 2010 to celebrate my 50th birthday and to give something back to Dr Kami, his wonderful team, and the Sherpa people of the Khumbu Valley. It was still in place and being used in 2017when I last visited. Dr Kami is such a humble man. Alan I was able to donate $30 to bring the amount to an even $4900. I’m sure you will make or surpass your goal. I hope to give more! Your blog is a well-loved window into a world I admire and appreciate from afar. You made my day Sharon! I sincerely appreciate the donation to Cure Alzheimer’s Fund.